What is a lymphatic tumor? This is a tumor of the lymphatic vessels of the skin or subcutaneous tissue. "Lymphatic vessels are a network of... vessels that drain lymph... from body tissues." Lymphatic vessels are a network of capillaries, ducts and larger vessels that drain lymph (a fluid containing proteins, other chemicals and cells such as macrophages and lymphocytes) from body tissues. The channels pass through a series of filtering lymph nodes (glands) and eventually into the bloodstream. 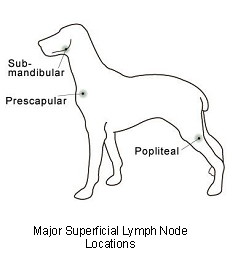 Some lymphatic tumors are benign (lymphangioma) and some malignant (lymphangiosarcoma). Both types are soft, poorly defined masses that may exude serous fluid. They are difficult to excise surgically because the borders are so poorly defined, but spread to other parts of the body (metastasis) is rare. Little is known about the cause of these tumors but some benign ones may be congenital malformations (hamartomas). "...rare in dogs and cats." Lymphangiomas are rare in dogs and cats. They are usually found in dogs less than eight years of age. Malignant tumors are even rarer. These tumors are usually found under the skin along the ventral (lower) midline of the abdomen and limbs. Lymphangiomas are fluctuating swellings that may become as large as 7 inches (18 cm) in diameter. Edema (local water retention in the tissues) is the main clinical feature of both benign and malignant tumors. Clear blisters, oozing fluid and ulceration are common signs of malignant tumors. In cats, distinction of lymphatic tumors from tumors of blood vessels (arteries and veins) is not always clear. Most lymphatic tumors are on the caudal (rear) abdominal wall but a few are intra-abdominal or internal chest masses. Clinically, the tumors are poorly demarcated, soft swellings that may ooze clear fluid. They can be confused with inflammatory reactions. In order to identify the tumor, it is necessary to obtain a sample of the tumor itself. Needle aspiration for microscopic examination of the cell sample (cytology) is not diagnostic. It is usually necessary to submit a tissue biopsy sample for histopathology, the microscopic examination of specially prepared and stained tissue sections. Your veterinarian will submit the samples to a specialized laboratory where a veterinary pathologist will examine the samples. Examination of the whole lump (excision) is preferable to a small part (biopsy), as this will allow the pathologist to assess the adequacy of excision. Distinction of benign and malignant tumors is difficult even on microscopic examination. Treatment is surgical removal. This may need to be extensive because of the spreading nature of the tumors. For malignant tumors, radical surgery or limb amputation has sometimes been curative. Cancer rarely disappears without treatment but as development is a multi-step process, it may stop at some stages. The body's own immune system can kill some cancer cells but is not effective against this type. Preventing your pet from rubbing, scratching, licking or biting the tumor will reduce inflammation. Any ulcerated area needs to be kept clean. After surgery, the operation site needs to be kept clean and your pet should not be allowed to interfere with the site. Report any loss of sutures or significant swelling or bleeding to your veterinarian. If you require additional advice on post-surgical care, please ask. How or when will I know if the cancer is permanently cured? "Lymphatic tumors are difficult to cure surgically." Lymphatic tumors are difficult to cure surgically and multiple recurrences are common, even for benign tumors. They may grow very large. Cure of malignant tumors is difficult. Distant spread to internal organs (metastasis) is occasionally reported. All cats followed up in one study were euthanized within six months because of poor wound healing, local recurrence or metastasis. No, these are not infectious tumors and are not transmitted from pet to pet or from pet to people.